The Most Recent - Page 4 of 28 - Blackburn Architects, P.C. : Blackburn Architects, P.C. 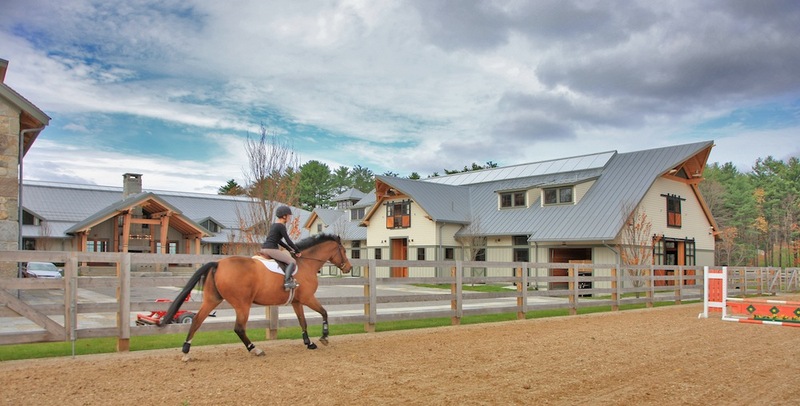 John Blackburn answers your questions about barn design. Long ago you were kind enough to give me a bit of advice about planning a barn. We got started last spring, but were waylaid by an evil contractor who put the barn in the setback, with poles only 18″ in the ground, and a drainage system two feet too high to catch any water. On top of that, he dumped 130 truckloads of bad, unnecessary fill, and built a retention pond that is 36% too small – UGH! Luckily it was all easily documented by the project’s engineer so we are able to recoup a little of the money laid out. So: moving along, we deconstructed the barn, redid all the drainage, and turned to a pre-fab barn. The new building is a 60×120 raised center aisle structure. I requested open sidelights and a ridge vent to help keep airflow going in the soggy, humid climate in the northwestern US. The stalls almost always will be open to an 8ft shed eave and attached paddock. Their fronts are composed of lots of steel mesh — so lots of air. I’m NOW STUCK. I feel quite stuck because no one around here understands your way of doing things. I’m trying to incorporate what I learned over the years from your publications. The roofing is 26g boxed rib metal panels. I requested polycarbonate panels be incorporated for natural light. The question is whether it’s unwise to let the whole raised center be polycarbonate, or go with only one light panel per 12ft section–and whether it’s crazy to use clear vs opaque white panels. (Most weeks out of the year it is damp and grey and cold here.) The barn company is in hot California so they think the whole idea is nuts. If moved to offer an opinion, please know I’m already grateful. I understand why you resorted to prefab because you’ve been thru a nightmare. However, prefab barns can be hot boxes in the summer, and don’t always provide adequate controls for natural light and ventilation. 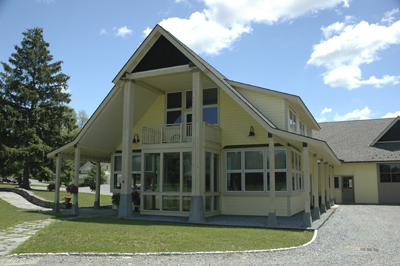 Pre-designed, pre-engineered buildings are typically designed the same for all areas of the country and no two areas of the country are alike nor are the sites. Environmental and weather conditions can differ dramatically so a prefab building designed to fit all sites just does not work best for the health and safety of stabling for horses. But I understand. You’ve selected the barn you want, now my advice is you should provide for as many options as you can for control of natural light and ventilation. You mentioned a 60 ft x 120 ft raised center aisle structure. How many rows of stalls are there in the barn? The best arrangement is to have one center aisle and a row of stalls along each side of the barn. The 60 ft width sounds like there are two main aisles with rows of stalls on both sides of each aisle. That would mean two of the rows of stalls are back to back and not on the exterior where they get adequate ventilation and natural lighting. The 8 ft shed eave is too low in my opinion. I use 12 ft as a minimum though 10 ft may work for smaller horses and if there are no obstructions below the roof. However, there are usually lights, fans, beams, etc. that drop down and they can be a danger to horses. I like the use of translucent polycarbonate panels. Translucent, not clear, as it breaks up the light and hides the dirt that accumulates on the skylight over time. Providing polycarbonate across the center aisle sounds nice, but I’m unsure how it will look on the barn design you selected. If you’re putting a skylight over the raised center aisle roof, what is on the face of the raised center portion? There is usually some sort of glazing or louver for venting. It will be important that these elements complement one another. Thanks for the question and I hope this is helpful. After Horse Racing: What Happens to Los Alamitos Land If Track Closes? As a Board member of the Equine Land Conservation Resource, a national organization dedicated to saving land for horses and horse-related activities, it’s disheartening to hear of the potential loss of a thriving racing venue for what will no doubt become another strip mall and urban sprawl. I have been concerned for years about the loss of race tracks, especially older ones in the inner city or suburban locations that are under pressure to close. Santa Anita was considering reducing their stable area several years ago and selling land to an adjoining commercial shopping mall. There was pressure to shut down Pimlico (an inner city aging track) and move the Preakness to Laurel Park. Suffolk Downs in Boston is under similar pressure. The list goes on and on. And of course the answer for many race tracks has been to add casinos, which do nothing for horses or horse racing except cheapen it. Racing is a great spectator sport. 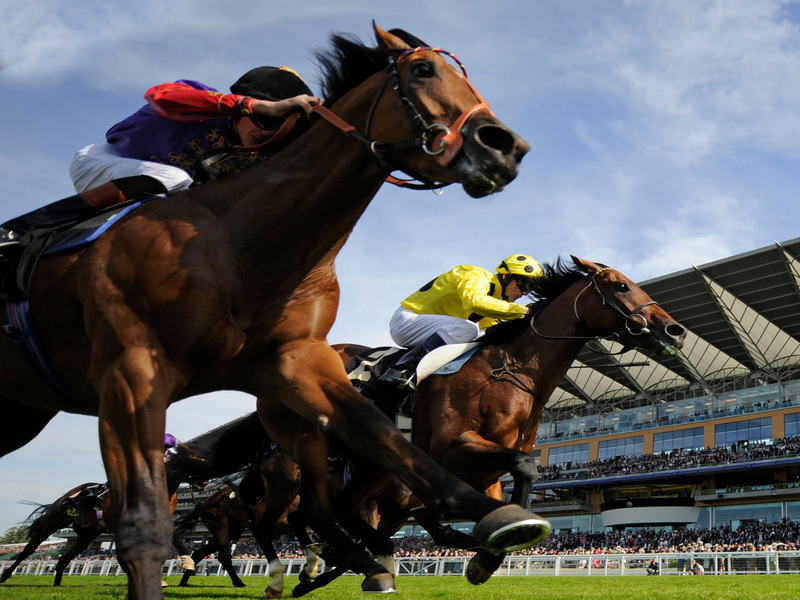 Look at racing in Europe, especially in England (Goodwood and Ascot are two prime examples) where horse racing is an enjoyable event not a place where desperation fuels gambling. The Los Alamitos track supports the horse economy, preserves open space, diversifies the suburban environment/landscape/streetscape/economy and preserves the equine heritage of the site and area. There are heartening success stories. When Illinois’ Balmoral Park hosted its last harness races at the end of 2015, a New York company, Horse Shows in the Sun, purchased the 200-acre site, and after a significant investment is preparing the grounds for show jumping competition starting next spring. I’ll be writing more about this in the months to come. To learn more about the Equine Land Conservation Resource and its mission, please visit their website at www.ELCR.org to become a member and get involved. This fall, I’ll be heading back to my Alma Mater to impart 40 years of architectural experience and equine design know-how to a new generation of architects. 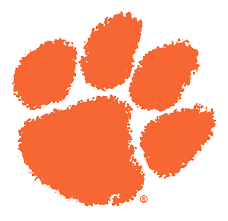 Go, Tigers! Beginning this August, graduate students and upper level undergraduates in the Clemson University School of Architecture will enjoy a unique opportunity for an immersive and interdisciplinary design course. “Studio Appalachia”-the John Blackburn Fall fluid studio- will focus on two projects selected to invoke a critical examination of contemporary design in the foothills of the Blue Ridge. 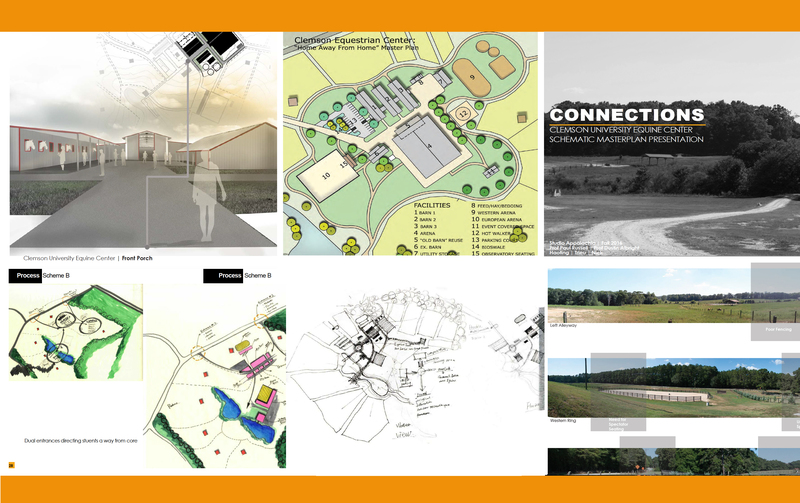 This blended studio will partner architecture and landscape architecture students in careful master planning and design exercises for Camp Hope in Canton, NC and for the Clemson Equine Center in Clemson, SC. The latter project will also incorporate Equine Business students as special consultants, and will draw heavily from the expert oversight of John Blackburn, who has dedicated much of his professional career to the art and science of equestrian architecture and planning. Healthy Stables by Design restocked on Amazon. Watch as John gives viewers advice about their barn projects on the popular series Wild About Barns. Coming off the heels of a truly epic storm for the Washington D.C. area (and most of the east coast! 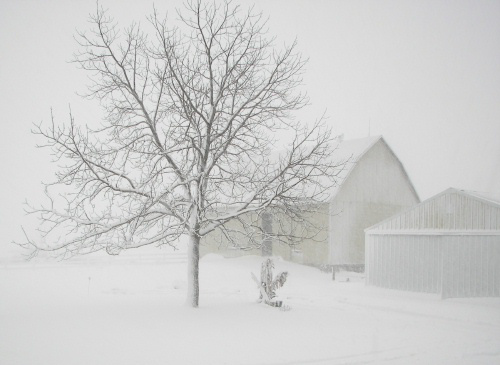 ), I thought I’d take a moment to address how design techniques can help barns “weather” extremes. In the United States, the upper northeast regions through to the Midwest are prone to experience weather extremes in the form of snow and ice. While we cannot entirely “weather proof” a barn, we can make it more resilient to some of the more damaging effects of weather phenomena. Redirect “roof avalanches” from sliding into high traffic or poor drainage areas and also reduce associated noise that could frighten the horses. Roofing material will also factor into how the snow will shed. 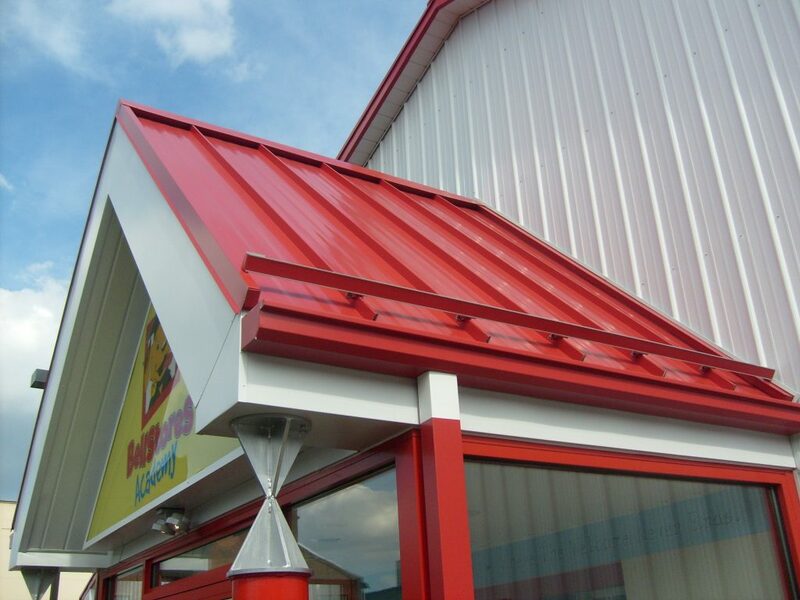 Metal roofs are excellent as they are smooth and slick. They will also stay colder longer; reducing the likelihood that snow will melt and form ice dams (more on this below). Snow will shed from a metal roof even if the pitch is lower. Shingled roofs, however, will slow down the shedding process by “holding on” to the snow and allowing it to stay in place and accumulate. Consider a steeper pitch if you prefer a shingled roof as it will facilitate the shedding process over the rougher material. Now, you might be saying to yourself, “Well, the snow is off the roof…but it’s all over the place! Now what?” Including strategic roof overhangs will complement the steeper pitch by helping to distribute shedding snow away from exterior walls and out of traffic and poor drainage areas. Be wary though, snow sliding off roofs can be noisy and frightening to horses, not to mention dangerous if it falls on you! Snow guards on the roof can help reduce the noise associated with shedding snow and keep huge sheets of it from falling on (and potentially harming) 2 and 4 legged passersby. Gabled dormers over entryways can also be useful. They help to direct snow off to the sides. Ice dams are another unfortunate side effect of snow-laden roofs. An ice dam forms when the underside of the roof gets warm enough to thaw the bottom layer of snow sitting on the other side. 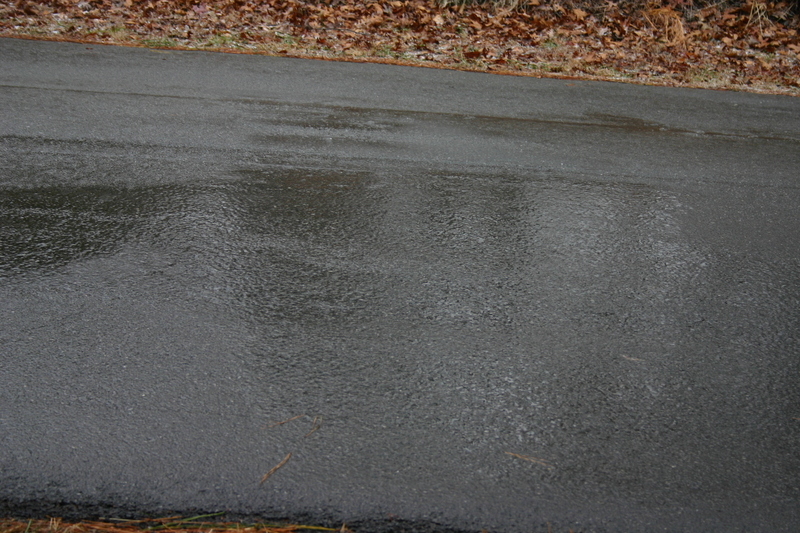 The water makes its way down to the eave where it refreezes, eventually growing into a mound of ice. 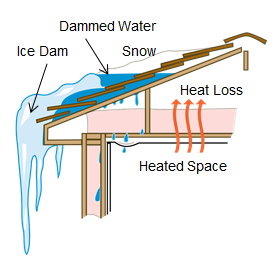 As the ice dam gets larger, it can pull the shingles and edges up allowing water to get through and into the insulation and walls. Water damage then wreaks havoc on the interior of the barn. 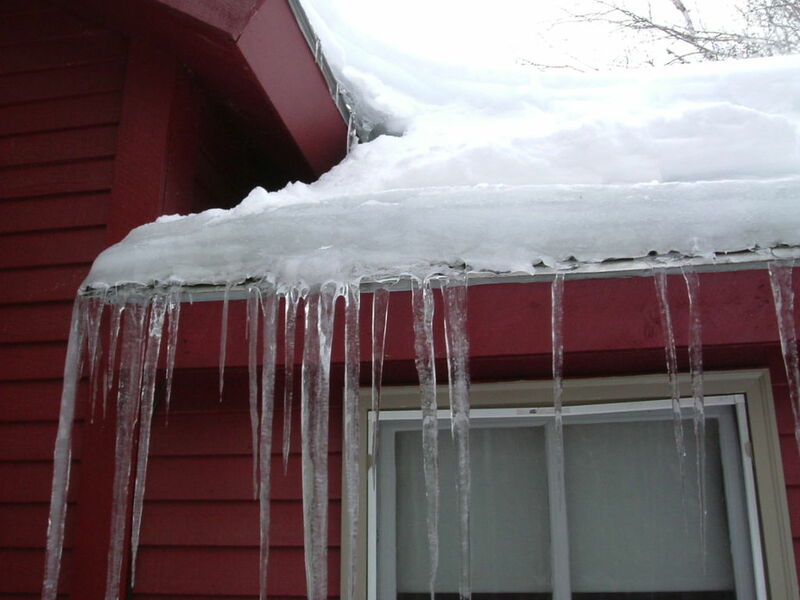 The ice dam could also break off the eave and take pieces of the roof with it or fall on passersby. Sure, there are ways to deal with ice dams once they’ve formed, but natural ventilation can help prevent them upfront. Natural ventilation keeps the underside of the roof within 10 degrees of the outside temperature, which aides in keeping that critical layer of snow right on top from thawing and running down towards the eaves. Site and circulation planning can help prevent and/or reduce the impact of icy conditions around equine walkways. In the interest of horse safety, I try to design site circulation so that horses do not need to move over asphalted areas intended for trucks and service vehicles (there are other benefits associated with that as well). 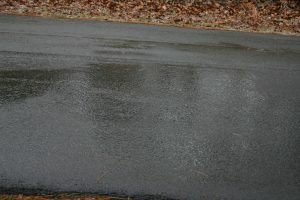 Asphalt is not great for horse’s knees, generally, but it is particularly problematic when wintery conditions lead to the formation of “black ice” — a thin sheet of ice over the asphalt that can be imperceptible to the horse or persons walking on to it. Horse pathways in and around the barn should include porous footing that absorbs and carries moisture away quickly. Presently there is no way (that I know of) to prevent pastures from freezing over, but you can maintain a dry paddock or “sacrifice” lot where your horses can be turned out when pastures have been effected by inclement weather. Paddocks with considerable slope can be particularly hazardous when they freeze over. That’s when a “level” dry lot can be very useful! As many on the east coast found out this past week, there is only so much preparation you can do in a couple of days before a storm hits. You, your horses, and your barn will benefit from built in preparation.